Kaby Lake now with four cores. Intel announces quad-core processors based on the current Kaby Lake architecture just in time for the CES. We already had the chance to test the CPUs in some laptops. Intel already announced new mobile processors based on the Kaby Lake architecture late summer last year. Contrary to the usual Tick-Tock model (new manufacturing process/new micro architecture), the concept was changed to a three-stage model. The new addition is the step optimization, which is represented by the Kaby Lake generation in this case. The previous 14-nm manufacturing process was further improved (14nm+) and improves the efficiency, which results in a higher performance at the same power consumption (TDP). The CPUs can now change their clocks faster, so they can better react to load changes. 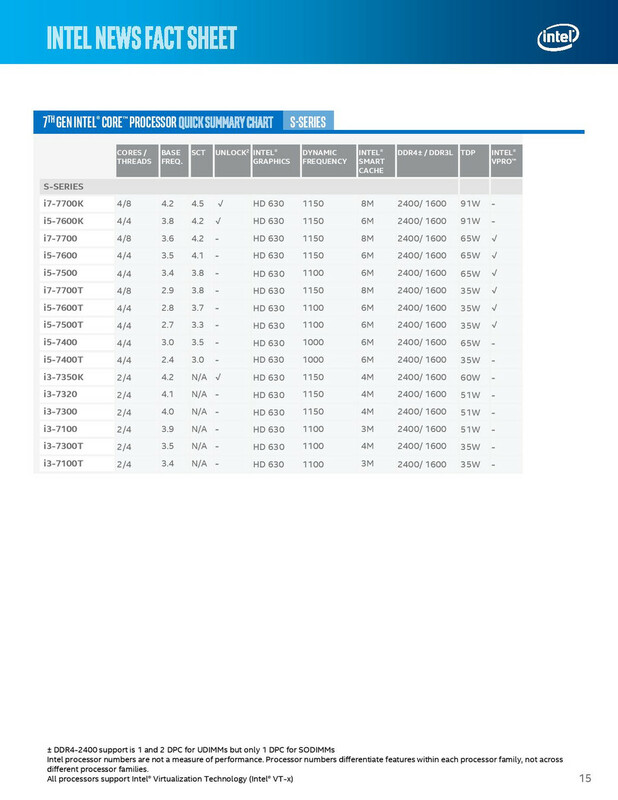 All the new chips so far belonged to the smaller performance classes with a maximum TDP of 15 Watts. We determined performance gains of up to 15-20% for the processor and even up to 30% for the integrated GPU in our comprehensive analysis. Intel now finally announced the quad-core models at CES. 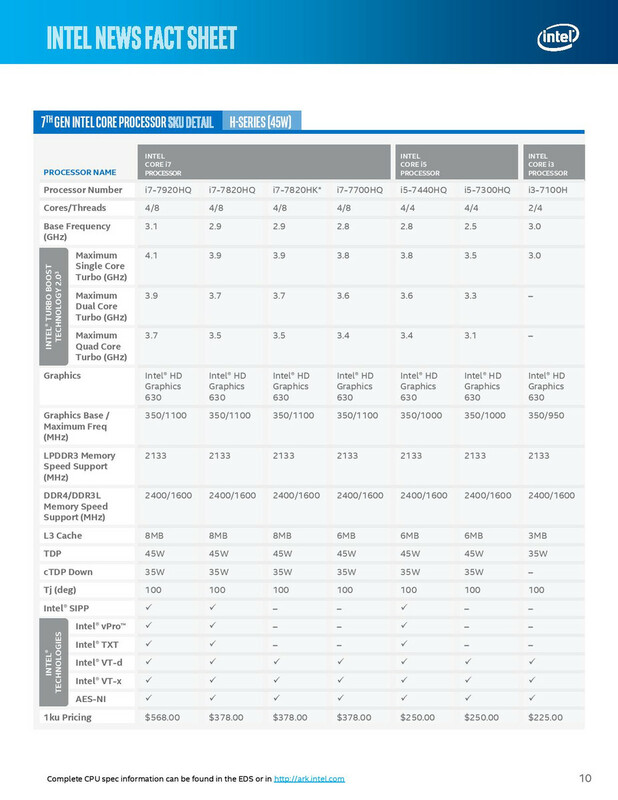 They will be mainly used in large multimedia and gaming notebooks with their TDP of 45 Watts. 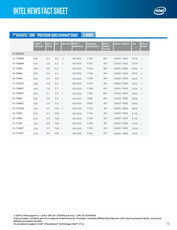 We will have a look at the different models and analyze the performance of two new models in this article. It is easy to see the scheme of the new models: The base frequency was raised by 200 MHz, and the Turbo Boost levels by 300 MHz each. All models are also equipped with the integrated HD Graphics 630, which gets 50 MHz more Turbo Boost. 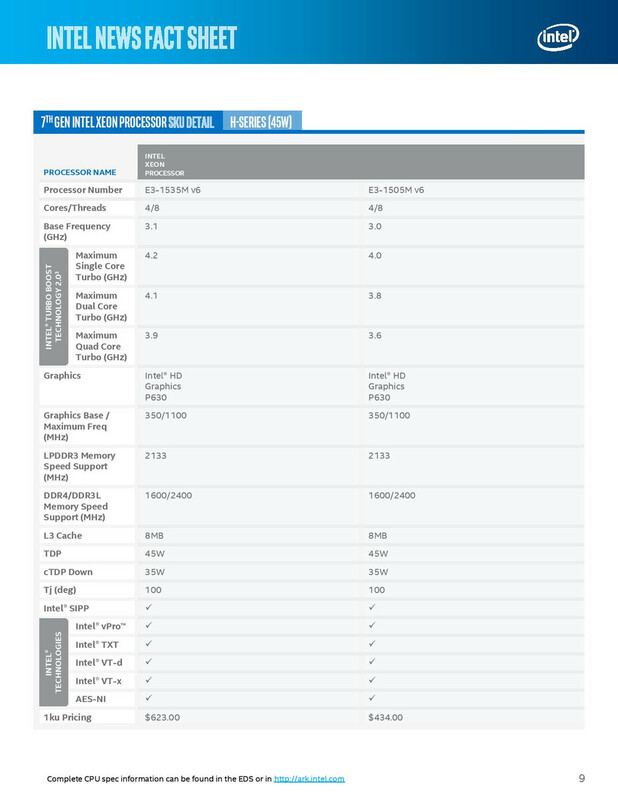 Intel still offers the dual-core i5 with a TDP of 35 Watts. However, the Skylake counterpart was already very rare and usually limited to barebones, where the processor could be configured. 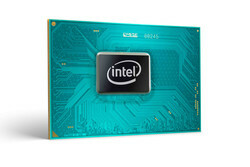 Intel changes the scheme a bit for the two mobile Xeon processors, which will primarily be used in mobile workstations. The more powerful E5-1535M v6 gets even more MHz and all four cores can reach up to 3.9 GHz, which is a bum by 500 MHz. It is therefore the fastest mobile processor from the 7th Gen Core i generation (Kaby Lake) on paper. Similar to Skylake, we should also see even more powerful model with the Intel Iris Pro Graphics (probably P680) in the future. Intel also announced the desktop chips with TDPs between 35-91 Watts, but there are no surprises, either. 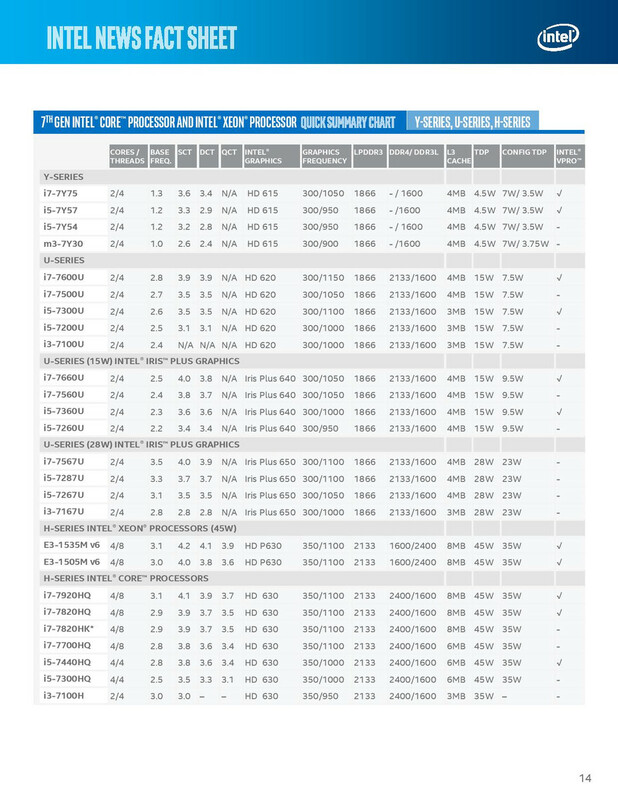 The TDP classes are similar, while the clocks where increased by 200-300 MHz depending on the model. Some barebones can be equipped with desktop processor, but we are more interested in the mobile chips, so we will not cover the desktop CPUs at this point. 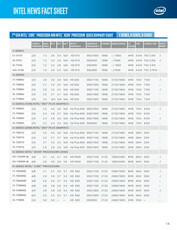 See the following tables for an overview about all available models. We could already test two processors, which will be very common amongst multimedia and gaming systems: The Core i7-7700HQ in the Asus ROG Strix GL753VD as well as the Core i7-7820HK with a free multiplier in the MSI GT73VR 7RF. 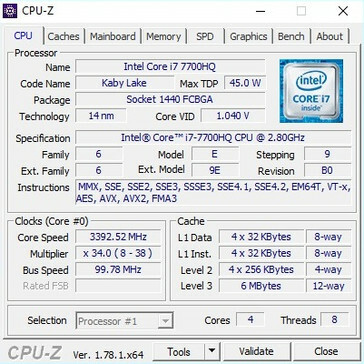 Based on the Skylake predecessors, many notebooks will be equipped with the i7-7700HQ due to its very good price-performance ratio. Let's start with the Core i7-7700HQ. The new processor can take the lead in the Cinebench R15 Single Test, but the previous i7-6700HQ is only a couple of percent points behind (-2 up to -7%). The advantage of the new chip is a bit bigger in the Multi Test at 8-11%. The situation is different for the Core i7-7820HK because of its free multiplier. The processor runs with 4.0 GHz in our test model from MSI, which was also often the case for the old i7-6820HK, so the differences in the benchmarks are very small. All in all, the advantages of the new 45-Watt Kaby Lake chips are pretty small and an upgrade is hardly worth it for users of Skylake or even Broadwell chips. Notebooks with the Core i7-7700HQ and the Core i7-7820HK in particular will usually be equipped with a dedicated graphics card, so the performance of the integrated Intel HD Graphics 630 is not that important. Our test model from Asus with a dual-channel memory configuration is only just ahead the HD Graphics 620 (+3 up to 4 %) in the benchmarks. The situation is different compared to the dedicated Nvidia GeForce 930MX, which has a clear advantage in the older 3DMark 11 (+27%), but is just beaten in 3DMark Cloud Gate (-7%). Note: The GPU scores were about 5% lower on a pre-production unit with single-channel memory. Still, the GPU advantages are not unimportant since laptops with switchable graphics can use the iGPU for simple task. We want to mention the improved video decoder in this respect, which now supports HEVC/H.265 Main 10 as well as Google's VP9 codec. More technical details are available in our tech section. The advantages of the new Kaby Lake chips with a 45-Watt TDP are pretty small compared to the ULV chips. Intel raises the clocks by around 200-300 MHz depending on the model, which will result in an advantage of up to 10%. However, this is usually only the case for processors with a fixed multiplier like Core i7-7700HQ. The advantage of unlocked chips will depend on the clocks they run at. There might be a bit more headroom thanks to improved efficiency, but the new processor (i7-7820HK) is basically on par with the Skylake predecessor in our test model from MSI. The graphics card is still the most important component for modern gaming notebooks. You do not have to worry if you bought a new system with a fresh Pascal GPU in the last few months. The advantages of the new models are very small during gaming and a Core i7-6700HQ should not be the limiting factor in the foreseeable future.